NU-CONcept only offers old fashioned daub for experienced, old fashioned traditionalists because of problems that all daub/paste style products have. Therefore, NU-CONcept STRONGLY suggests using dust based daub formulas. N-Dust (21st Century technology is superiour to Juice Dust (TM) and offers significant advantages over daub/paste early 20th century formulas. Your average cost is 75 cents per marked deck. Each marker will mark about 150 decks of regular paper based playing cards (depending upon the size and intensity of your marks). ALL Daub/paste products can never be as deceptive as Juice Dust (TM) technology. This is because daub/paste products will tend alter the reflection when light hits the back of daubed cards at a bad angle. As you might expect any paste-like substance will have a "dulling" effect on the finish of a shinny card. 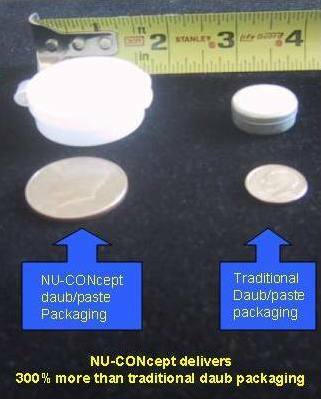 NU-CONcept offers this traditional daub/paste product only for old-time, experienced traditionalists. Tested on Bee, Bicycle, Tally-Ho, Hoyle, Aviator & most paper based cards. NU-CONcept advises that instead of using luminous daub/paste, beginners & intermediate customers should use red, blue or green daub or, preferably, Juice Dust (TM) which is much easier to use and read than luminous daub. With luminous daub, you must try to keep daub on red areas of the card and avoid the white areas of the card. This is difficult to do, since daub is applied with your finger. With the red or blue daub or Juice Dust (TM) this is not a significant concern. (This product is NU-CONcept's hardest to use product and is generally not recommended. But, we will sell it.) (NOTE: On the other hand, Ultra-Luminous daub/dust may be used on most color cards (red, blue, etc.) and can be used on white areas of playing cards (such as white borders). Deceptiveness is dependent upon the experience level of the person who applied the daub/paste. As stated above, the user must learn how to deal with the potential dulling of the finish where the daub/paste mark is applied. Note: N-Dust and Juice Dust (TM) is far more deceptive because it will NEVER dull the finish of your cards. 1 can of daub (3 times larger than traditional packaging), NU-CONcept manuscript, video clip CD and 10 USPCC Stamp Seals (to make resealing a marked deck in it's original case easy).